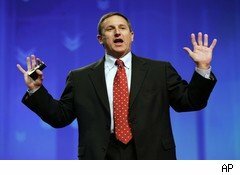 Oracle (ORCL) has hired Mark Hurd, former CEO of Hewlett-Packard (HPQ), to be its co-president. The technology company has also put him on its board of directors. This is a crucial time for the tech giant. It needs someone at the helm who knows data and storage, which is key after its expensive acquisition of Sun Microsystems. Moreover, a stronger hardware-software Oracle will be better positioned to compete with HP and IBM (IBM), as well as software rival SAP (SAP). Oracle founder and CEO Larry Ellison certainly thinks highly of Hurd. Ellison said in an Oracle press release: "Mark did a brilliant job at HP and I expect he'll do even better at Oracle. There is no executive in the IT world with more relevant experience than Mark." In order to make room for Hurd, one of Oracle's current co-presidents, Charles Phillips, has resigned, the company said. A close look at Oracle's management structure shows that the co-president who will stay, Safra A. Catz, was formerly the chief financial officer and is largely involved in internal management. Phillips' role was more external. "Charles has evolved our field culture toward a more customer-centric organization and improved our top- line consistency through a period of tremendous change and growth," said Ellison. He runs Oracle's other large operation -- software development -- himself. Succession Plan in the Making? The co-president structure appears to set up a competition between Hurd and Catz over who'll become Oracle's next CEO. Hurd has the advantage. He has run two huge tech companies -- NCR (NCR) and HP, which is more than four times the size of Oracle. HP's revenue last year was over $114 billion. Oracle's was shy of $27 billion. Ellison is 66 years old and owns over 20% of Oracle's shares. He has been CEO since Oracle was founded in 1977. Hurd is 54. With his background and Ellison's support, is Hurd likely to become CEO as Ellison moves toward retirement? Almost certainly. Hurd has been there, done that.